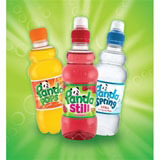 Soft drinks brand Panda has reinvented itself, removing all artificial flavours and colours and introducing real fruit juice to a relaunched range. The overhauled brand identity, pack graphics and plastic bottle design are by Butcher & Gunderson. Bottles are ‘grippable’ and feature embossed ‘panda paw prints’.